Answer: Earth’s orbit around the Sun is not a perfect circle. It’s an off-center ellipse. As a result, the distance between the Earth and Sun changes continuously throughout the year. They are closest on January 4th. 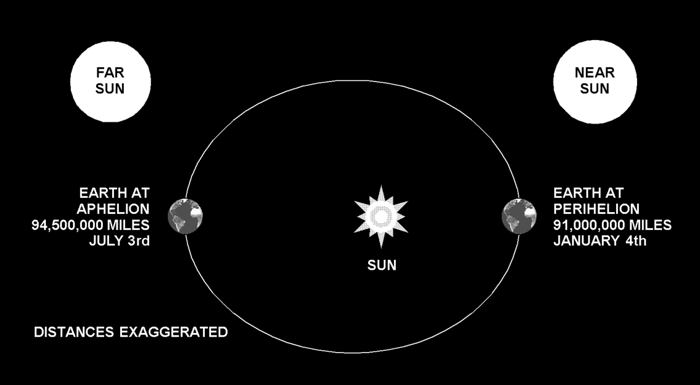 This astronomical configuration is known as perihelion. Then “Why,” you might ask “is it colder in January than the other months?” That’s a good question. The difference in the maximum and minimum distances is only ±3.8%. That’s not enough to make a noticeable difference in temperature. Seasonal temperature changes are caused by the tilt of the Earth and the angle of sunlight. So does the Sun at least look larger at perihelion? Yes, but not by much — it’s only about 3.8% larger. Your eyes could just detect this difference if you looked for it. The two white discs above differ in size by 3.8%, and show the change in the size of the Sun as seen from Earth. Because this change is so gradual, taking 6 months for one cycle, it’s not something you would normally notice. But if you have photos of July and January sunsets (or sunrises), taken with the same camera and focal settings, the difference in size should be just barely discernible.